Teams from Ghana, Malawi, Namibia and Rwanda during the inception meeting of the African Biodiversity Challenge Project in Kigali, Rwanda. Photo by Yvette Umurungi. 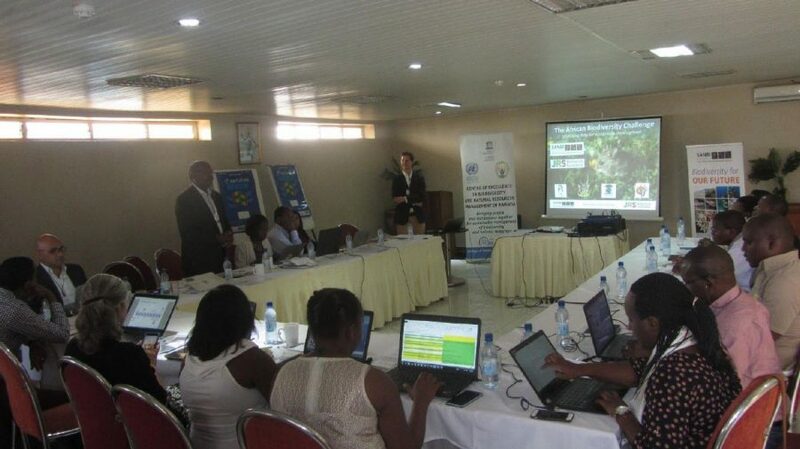 The establishment and implementation of a long-term strategy for freshwater biodiversity data mobilisation, sharing, processing and reporting in Rwanda is to support environment monitoring and the implementation of Rwanda’s National Biodiversity Strategy (NBSAP). In addition, it is to also help us understand how economic transformation and environmental change is affecting freshwater biodiversity and its resulting ecosystem services. The conference abstract for this project has been published in the open access journal Biodiversity Information Science and Standards (BISS). The CoEB has a national mandate to lead on biodiversity data mobilisation and implementation of the NBSAP in collaboration with REMA. This includes digitising data from reports, conducting analyses and reporting for policy and research, as indicated in Rwanda’s NBSAP. The collation of the data will follow the international standards and will be available online, so that they can be accessed and reused from around the world. In fact, CoEB aspires to become a Global Biodiversity Informatics Facility (GBIF) node, thereby strengthening its capacity for biodiversity data mobilisation. Data use training for the African Biodiversity Challenges at the South African National Biodiversity Institute (SANBI), South Africa. Photo by Yvette Umurungi. The mobilised data will be organised using GBIF standards, and the project will leverage the tools developed by GBIF to facilitate data publication. Additionally, it will also provide an opportunity for ARCOS to strengthen its collaboration with CoEB as part of its endeavor to establish a regional network for biodiversity data management in the Albertine Rift Region. The project is expected to conclude with at least six datasets, which will be published through the ARCOS Biodiversity Information System. These are to include three datasets for the Kagera River Basin; one on freshwater macro-invertebrates from the Congo and Nile Basins; one for the Rwanda Development Board archive of research reports from protected areas; and one from thesis reports from master’s and bachelor’s students at the University of Rwanda. The project will also produce and release the first “Rwandan State of Freshwater Biodiversity”, a document which will describe the status of biodiversity in freshwater ecosystems in Rwanda and present socio-economic conditions affecting human interactions with this biodiversity. The page of Center of Excellence in Biodiversity and Natural Resource Management (CoEB) at University of Rwanda on the Global Biodiversity Information Facility portal. Image by Yvette Umurungi. The ABC project is a competition coordinated by the South African National Biodiversity Institute (SANBI) and funded by the JRS Biodiversity Foundation. The competition is part of the JRS-funded project, “Mobilising Policy and Decision-making Relevant Biodiversity Data,” and supports the Biodiversity Information Management activities of the GBIF Africa network.